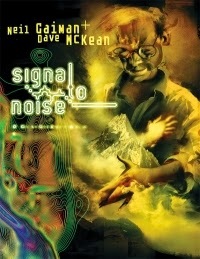 At first glance Signal to Noise is not a horror story. For one thing, it contains none of the genre’s familiar trappings. 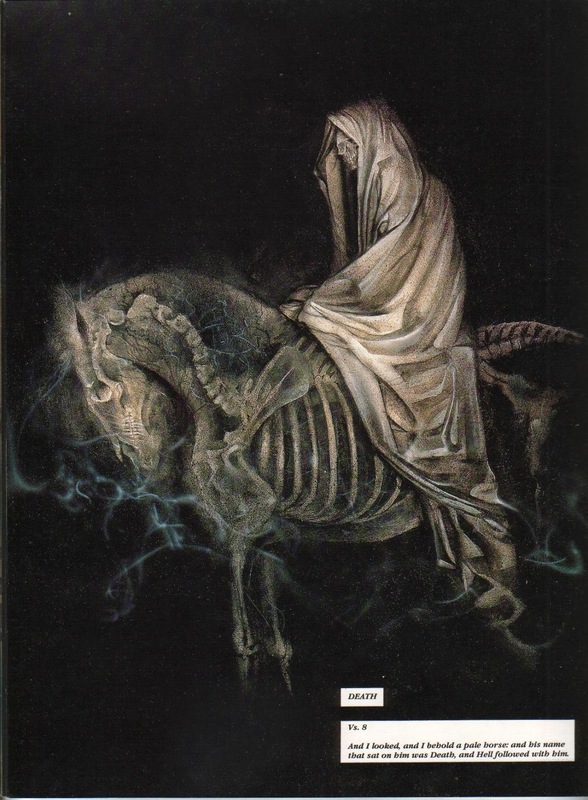 For another, it reads more like a man’s last confession than a terrifying plunge into the realm of the weird. Despite these differences, the graphic novel offers one of the darker, more unsettling narratives I've come across. At the onset of the story we are introduced to the narrator, an accomplished film director recently diagnosed with a terminal illness. He tells us he has been given only months to live and must begin to put his things in order. He instead chooses to disconnect from the outside world, limiting his interactions with other people as much as possible. As the days turn to months, and his mortality looms ever closer, he resolves to devote himself to the only thing he has left: creating his magnum opus - a film titled Apocatastasis. 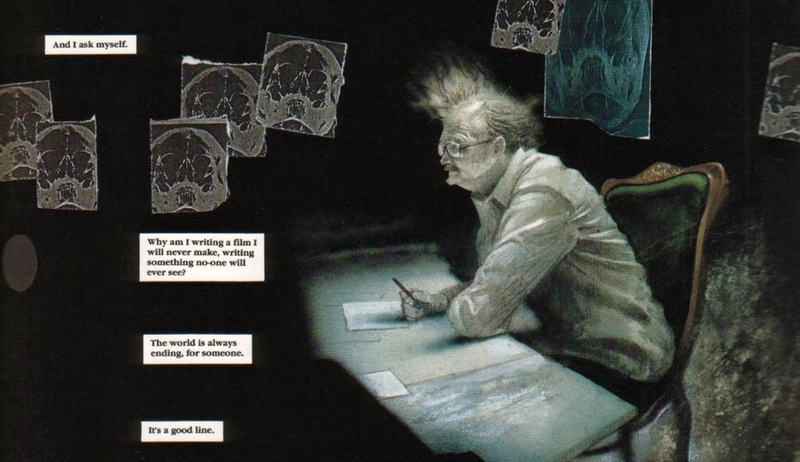 Only, with no time to actually produce the film, he begins to shoot the movie in his head. From this moment we are treated with a meditation on living and dying, escapism and what value our creative endeavors have after we’re gone. In short, the narrator is no longer just facing his own death, he is also facing the death of an idea, perhaps the idea, and by extension his legacy as a creator and a human being. The book opens on a scene inside the narrator’s head. He describes a group of villagers in the year 999 A.D. that come to the realization their world is about to end with the coming of the millennium. 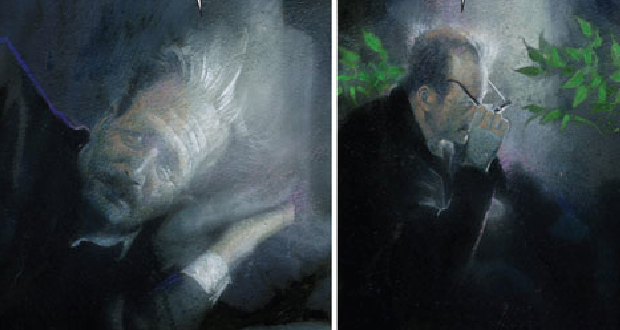 The colors McKean uses in these recurring daydream sequences are muted, relying heavily on black and dark blue in contrast to the yellows and grays of the real world. Interestingly, as you continue to read, the colors from the dream world begin to bleed into the real world, showing a subtle shift in the emotional proximity of the man to his hopeless actors. This “bleeding” of color eventually culminates in the man imagining himself as one of the people in the film. He soon retreats to their snow-covered hills, joining them as they wait for death. The voice of the narrator is integral to the story, and Gaiman proves more than capable of giving us the necessary insights into the character. He shows us our world through a drastically different lens than we’re used to, and it is very easy to sympathize with the narrator as he waxes philosophical about his approaching death. If you read this story casually, which is not advised, you are likely to miss the horror embedded in its narrative. While the plot is mostly overt, the grief the man experiences for his own death is subtle and relies on you being empathic enough to relate to it. If you take time to excavate the themes and the meaning behind the words you will find a gem buried in the bleakness, a light amidst the terror of dying while the world carries on without you. Signal to Noise tells us that stories can live forever, so long as there are people left to hear them, and that a time will come when they must exist without us. This is a subtle, introspective story that offers the reader an exceptional blend of light and dark. Fans of the Sandman series will feel right at home, and anyone who appreciates McKean’s unique art style will find plenty to gawk at. Highly recommended for those interested in a short, albeit haunting experience.